In a Cash Crunch? Need Money to Pay Bills, But Have Limited Loan Options Due to Bad Credit? Then Discover in This Episode Why These Loan Options Are a Very Bad Idea! People with bad credit, living paycheck to paycheck, often find themselves with few options when unexpected expenses crop up, or they have a drop in income due to a reduction of overtime or their work hours but not a reduction in their living expenses. As a result, they become desperate for a way to pay the bills, creating a recipe for desperation. Three of the options they turn to are payday loans, car title loans, and pension loans. However, they have a tendency to make matters much worse, and as such, should be avoided at all costs. 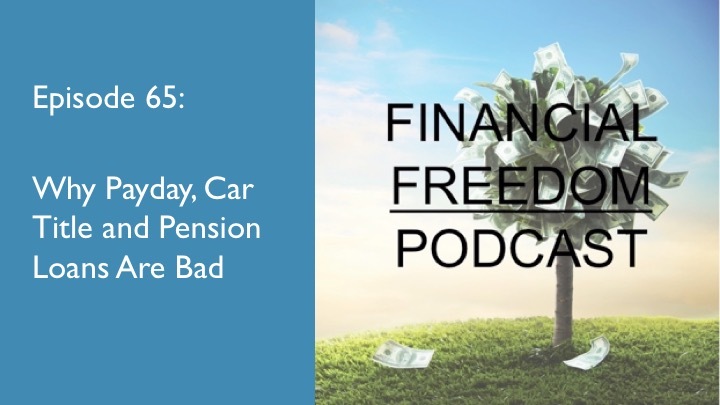 That is why in this episode of the podcast I wanted to talk about these loans, why they are the wrong solution, and why you should avoid them if at all possible.